November 15, 2017 - Vincent Valton is only in his early thirties but already has 15 years of professional experience under his belt. He carried out his training with the compagnons du devoir (trade guild) before working abroad for 4 years, in Melbourne, New York and Kobe. He returned to France in 2012, and began working in Research and Development for Fauchon, where he remained for 5 years. Vincent Valton is an ambitious young Chef whose passion for travelling inspires him to be constantly innovative. His resulting pastry style is one in which the flavours are pure and straightforward and textures are a key player. How did you become a pastry Chef? Where did your passion come from? My grandmother and my brother gave me my passion for pastry. My grandmother made brioches every Sunday and cooked family meals. Nobody in my family has a background working in the Culinary Arts but we have always loved food. My brother, who is 5 years older than me, is a chef. I remember loving what he made when he learned to cook, he is so passionate! All these things inspired me and made me eager to discover the world of pastry. I didn’t want to follow in my brother’s footsteps; I was more interested in sweet than savoury. Could you tell us about your career path before Le Cordon Bleu? I grew up in Frignicourt, I did very well at school and entering the pastry profession was my choice. At the age of 15, I decided to join the compagnons du devoir. It was fairly tough at the beginning; I had to learn about life and the job. I carried out my 2 year apprenticeship at the “Four à bois”, a highly reputed boulangerie/pâtisserie in Reims and took my CAP. I then studied for a BTM (Brevet Technique des Métiers) in Lille (“Boulangerie-Pâtisserie Pitman”) and in Montpellier (“Saveurs sucrées” at the Jardin des sens, the 3 Michelin-starred Pourcel brothers’ pâtisserie). This marked a new chapter in my life. I was 19 years old, had passed my exams and wanted to learn to speak English. I headed to Melbourne, again with the compagnons du devoir. I began at “Laurent Bakery”, a bakery/ pâtisserie which makes traditional French cakes. I worked in a variety of roles (production, finish), in the position of supervisor chef. I decided to leave the compagnons du devoir as I wanted to make career choices which weren’t compatible with the responsibilities of being a member: travelling, my second passion after pastry. I therefore joined my long-time friend, François Daubinet, in New-York, and began working in the “Financier Pâtisserie” kitchen brigade in the heart of Manhattan. It was very French pastry focused. I remained there for 2 years and was completely bilingual by the end. I then went to Kobe, Japan, for 1 year, working at “pâtisserie Gregory Collet” as sous-chef. It was a very rewarding year. My CV didn’t yet feature any renowned establishments, so I decided to return to Paris and try my luck. I began working at Fauchon, and evolved into an R&D role one year later. Those wanting to take on the position had to apply from within the company. I came out on top and was put in charge of R&D at Fauchon, where I stayed for a total of 5 years. I worked with chef Patrick Pailler. Customer contact is non-existent in R&D and I was eager to experience other aspects of the profession. That is why I went on to become a Chef Instructor at Le Cordon Bleu Paris institute. Could you describe a typical day in the life of a pastry Chef? Every day is different: on the teaching side, I give demonstrations and take practical classes but, on the creative side, I also work in the lab. In addition, I teach culinary workshops to amateurs who are passionate about pastry. Transmitting expertise and interacting with students is very rewarding. I really enjoy it! I chose teaching because I was keen to discover another side to the industry. I wanted direct feedback, to share my knowledge of the job and to hone my teaching skills. What advice would you give to somebody who is thinking of becoming a Chef? What are the essential qualities? My advice would be to train in France, get experience in renowned establishments and then work abroad as a chef. 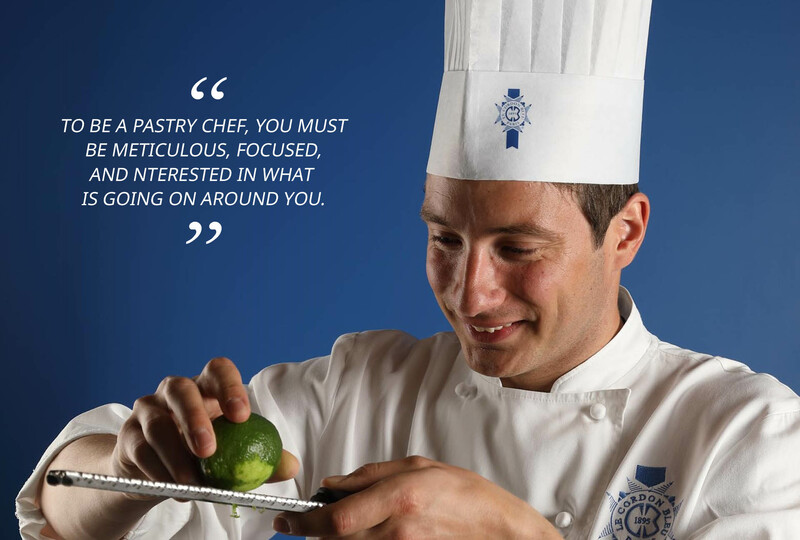 To be a pastry chef, you must be meticulous, focused, careful and, above all, interested in what is going on around you. Try different pastries or even use Instagram which is a great source of information and inspiration. An anecdote about your career? As my career progressed, originality has become increasingly important. Flavours can get lost when you attempt to do too much. I try to use no more than 3 flavours when I create my pastries and ensure textures play a starring role. I aim to create flavours which are pure on the palate, which somewhat reflects my character.